20 double-paged print ads that represent the epitome of creativity! It’s a common perception to imagine print ads don’t have room for innovation, but this is untrue. These magazine spreads prove that thinking outside the fold can let creative seep its way anywhere. Making magazine ads a place for creative imagination is an effective advertising strategy that makes these products stand-out. Creative print advertisement campaigns can still be a powerful medium for getting the brand message across. If print media ads in brochures, print catalogs, flyers, posters and even billboards are created in a funny way, catching the attention of readers will be a lot easier. As a bonus, here are 10 examples of renowned print advertisements that showcase the creative minds behind the brands. This typographic ad was created by OgilvyOne in Dubai. This simple but powerful ad was created by the agency Below. TBWA Shangai created the ad. Wacom desingned the advertisement for Bamboo pen tablets. This infographic ad was created by BBH. Publicis Frankfurt created this impressive ad. The ad was created by Ogilvy & Mather Mumbai, India. 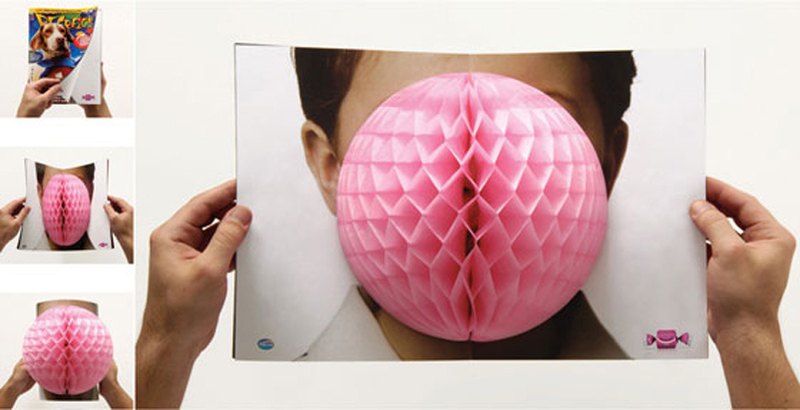 Chewing Gum brand, Hubba Bubba, worked with the team at DDB to create this great example of print advertising. JWT Frankfurt created the ad. Draftfcb created this clever print advertisement. Did we miss any? Feel free to share your favorite print ad.